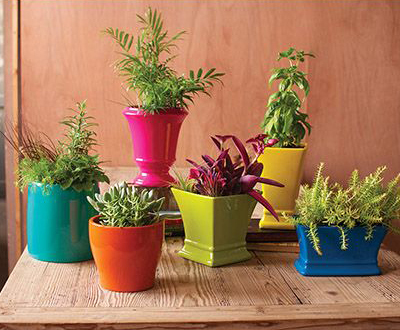 Planting herbs and spices has never been more fun than with this Multi-Colored Ceramic Planter Set! Includes: Turquoise, blue, pink, green, orange and yellow planters. $124 Sale $103.95. Buy here. 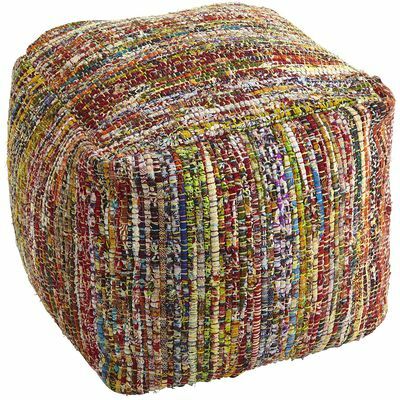 This Multicolor Diamond Wool Pouf features a thick multicolor diamond weave and plush filling. This comfy cushion is ideal for distinguishing small spaces or adding an extra seat for guests without taking up too much floor space. $99.99. Buy here. 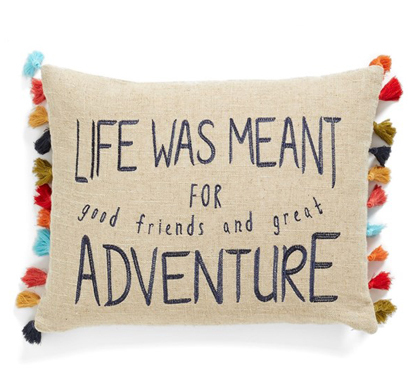 Colorful tassels trim the sides of this decorative linen and cotton-blend Life Adventure Accent Pillow marked with embroidery that reads, “Life was meant for good friends and great adventure.” $39. Free shipping. Buy here. 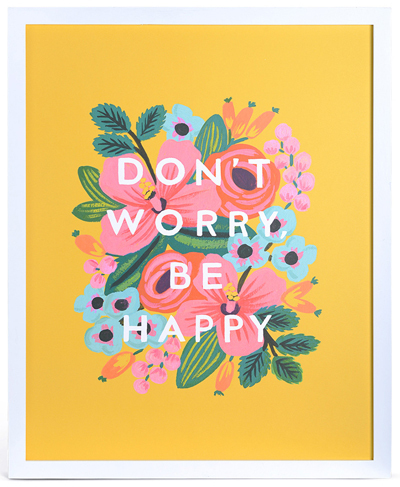 This cheerful Don’t Worry Be Happy Print will surely start your day off on a good note! Sunny yellow & bright florals perfectly accent this happy message. 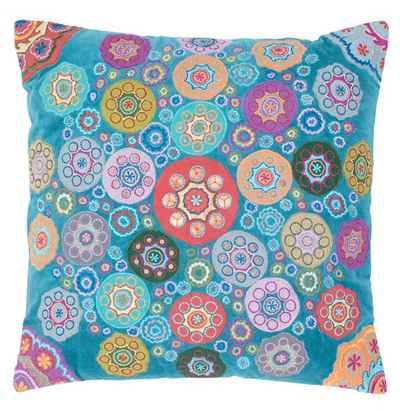 It’s large enough to make a statement solo above your bed or dresser, or add it to your gallery wall for a pop. Includes white frame. $90. Buy here. This Flower Orimono Pillow features jewel-tone prints reminiscent of Japanese yukatas cut into rounded petals and patched atop cotton canvas. No two pillows are exactly alike. $88. Buy here. 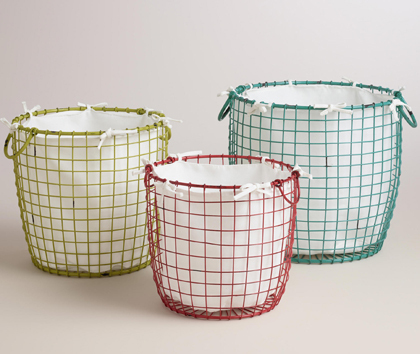 Round, colorful and outfitted with hinged handles and removable cotton liners, these bright Wire Round Kenna Baskets are a cheerful solution for laundry or storage. Choose from small in coral, medium in apple green or large in deep turquoise. $29.99-$49.99. Buy here. 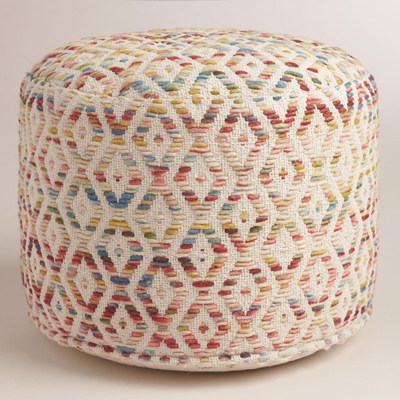 This hand-woven Chindi Floor Pouf makes great seat or ottoman, or turn it into a table with a tray on top. $99.95. Buy here. 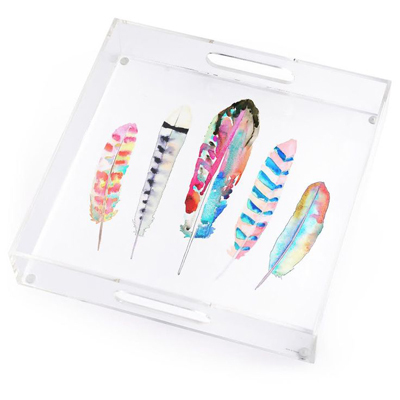 A chic lucite tray is made all the more stylish with colorful fall feather print art. Use this Feather Print Lucite Tray is perfect to serve steaming cider on or just let it shine solo to let the bright feathers stand out. $75. Buy here. 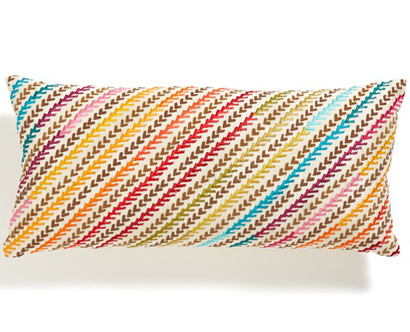 This Multicolored Throw with Pom-Pom Fringe from the Grandiflora bedding collection adds dose of color to a sofa or bed. Measures 50″ x 60″. $120. Buy here. 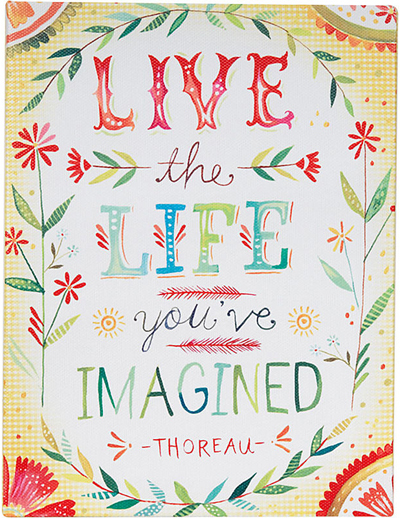 Display a beautiful message in your home or office with this cheery Live the Life You Imagined Box Sign that features a floral watercolor design and colorful typography. $17.95. Buy here. 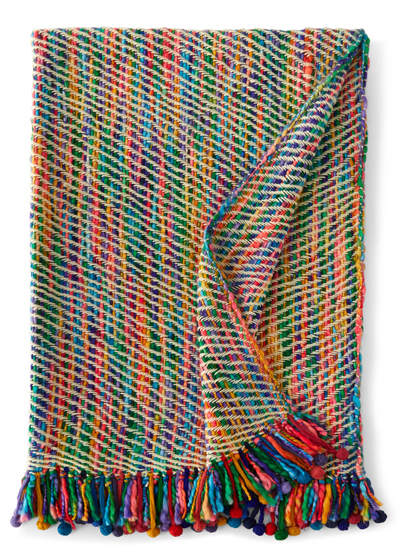 The bounty of colors on this Rainbow Fringe Throw are sure to keep your home both happy and comfy! 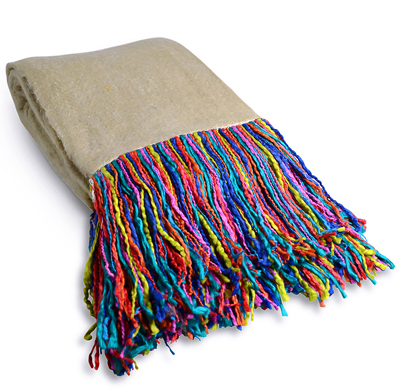 Let the colorful fringe stand out by draping over the edge of your bed or across the back of your sofa. $78.50. Buy here. 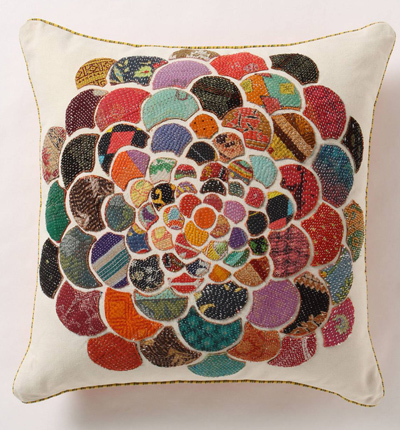 Brighten up any space with this vibrant cotton-velvet Geo Floral Accent Pillow embellished with floral medallion embroidery and delicate beadwork. $49. Free shipping. Buy here. 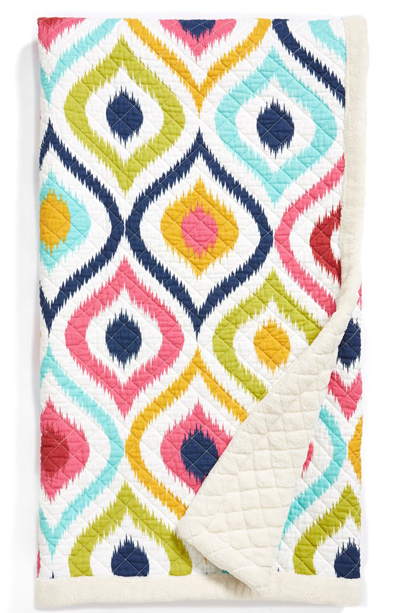 Enhance any living space with this colorful cotton Lantern Throw fashioned with plush fabric on the reverse for a cozy finishing touch. $48. Free shipping. Buy here. 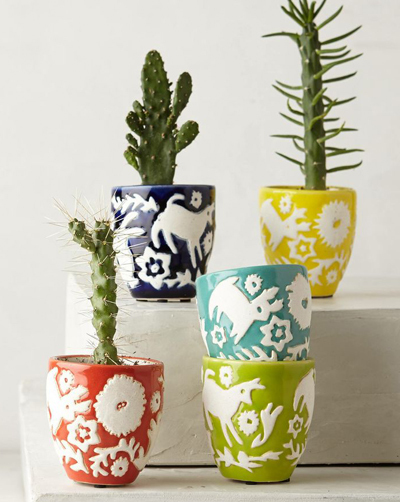 Vibrant Mexican landscapes and traditional papel picado motifs inspired this imaginative Concha Garden Pot Set. 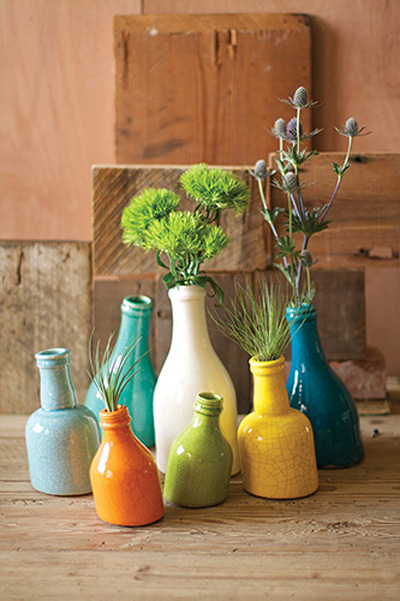 They’re just the thing to liven up your entryway or windowsill. Set of five. $40. Buy here. This multihued Slanted Arrows Pillow with alternating chains of printed and embroidered chevrons effortlessly jazzes up your décor. $59. Free shipping. Buy here. 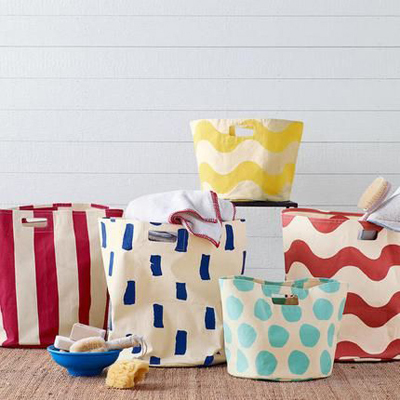 Stay organized with the fun, sturdy colorful Sturdy Canvas Carry-Alls. Convenient for the whole family. Made of cotton canvas. $48. Buy here. 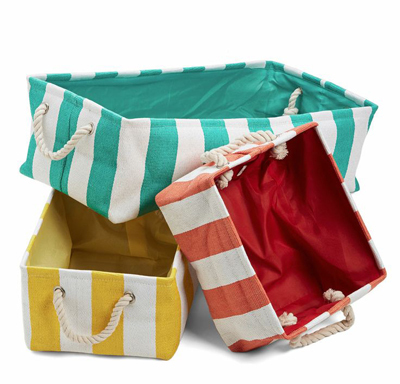 This cotton-lined Beach and Every Day Basket Set includes one rectangular- and two square-bins that boasts nautical rope handles and primary hues that add to the cheer of your house. $57.99. Buy here. 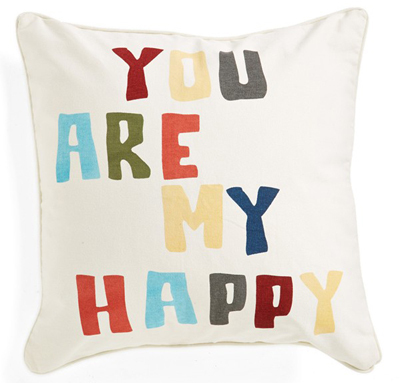 This playful ‘You Are My Happy’ Pillow features an uplifting message stamped on the front. 20″ square. $34. Free shipping. Buy here. 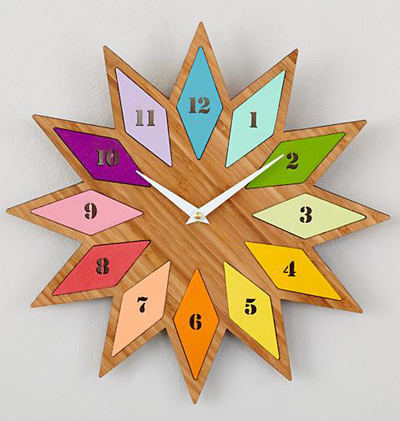 Featuring beautiful, vibrant colors on a rich bamboo background, the Chromatic Bamboo Clock looks so good you’ll want to check the time all the time. Various hand-painted colored backgrounds feature laser-cut numbers 1-12. $119. Buy here.